This was a new build Hospital, built within the confines of an existing ‘live’ hospital site and is at the heart of a community development programme along the west coast of Cumbria that incorporates In-patient beds; Urgent Care/Outpatients; Radiology Department; Endoscopy Department; Coronary Care Unit; Minor Ops Facilities; 8 No. Operating Theatres including 2 No. UCV; Estates & Support Accommodation. 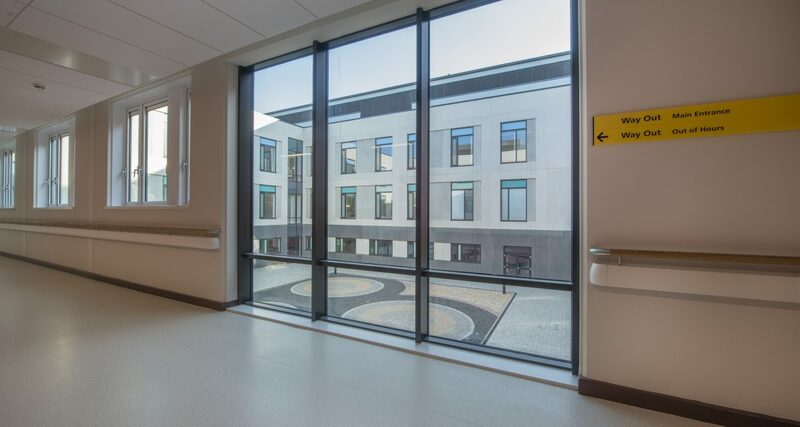 DSSR worked closely with the Trust Estates team to ensure that the new primary services required for the new building were integrated into the existing hospital estate without causing any disruption to the operation of the hospital. In developing the scheme, DSSR took a sustainable approach to the design of the hospital in which all Patient Bedrooms are naturally ventilated. The building design uses passive environmental design principles to achieve the requirements for good levels of natural ventilation and daylight whilst maintaining comfort of occupants. LED lighting was used throughout. As part of the engineering strategy, DSSR identified an Energy and Sustainability strategy to reduce the whole site CO2 emission by 20% over a 2006 benchmark. The design comprised many innovative modular construction techniques to minimise on site disruption to both the local community and the existing hospital staff and patients.